The Garrison Brothers Negroni. Photo credit Julia Keim. The Houston competitors included Cody Northcutt (Ready Room), Dakota Jones (Whiskey Cake Baybrook), James Cone (Wicklow Heights), Rigo Aranguren (Mastro’s Steakhouse) and Will Wagner (Pinkerton’s BBQ). 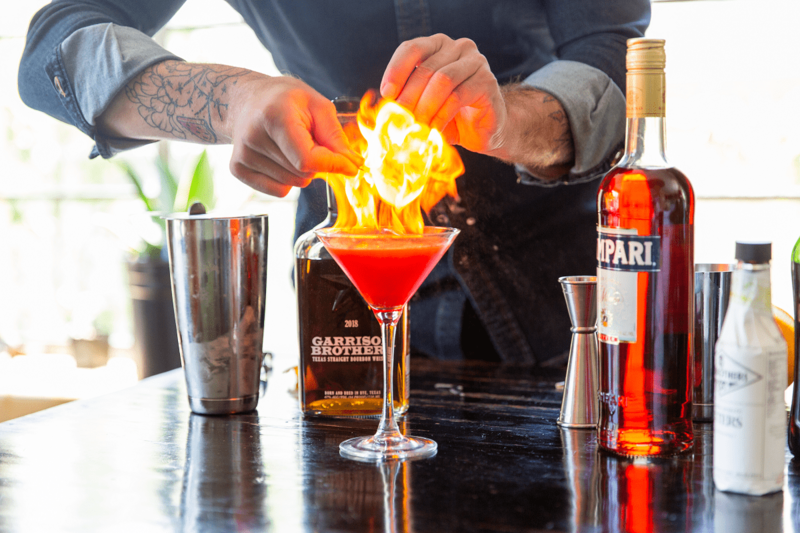 The competitors explained their cocktails to attendees and hoped for the crowd-favorite vote that would guarantee one of the two spots in the final showdown. The other was awarded by a panel of judges, including Dan Garrison. Northcutt won the crowd favorite with his The Hye-Five cocktail, named after the distillery’s hometown of Hye, Texas. Northcutt combined Garrison Brothers 2019 Small Batch bourbon, Martini & Rossi Rubino vermouth, orange liqueur, house-made coffee liqueur and Vieux Pontarlier absinthe. Multiple attendees could be heard discussing how innovative and successful his decision was to include absinthe. Northcutt wasn’t the only competitor to use advanced techniques. For his cocktail, Aranguren fat-washed the bourbon with A5 wagyu fat from Mastro’s Steakhouse. Fat washing involves adding the liquid fat into the spirit at room temperature, leaving it to sit for a few hours, and then chilling it to solidify the fat so it can be skimmed off. The end result is a spirit that gains additional flavor and body without being “fatty.” Aranguren also added a simple syrup made with Lone Pint Brewery’s Yellow Rose IPA, flamed angostura bitters and grapefruit juice. It was a masterful creation, and though the judges didn’t advance Aranguren to the final two, his cocktail is on the menu at Mastro’s Steakhouse whiskey bar. It is complex and interesting enough to warrant the $25 price tag. Other entries included Jones’ Harris County Sour — a riff on a whiskey sour with Benedictine, yellow Chartreuse, aquafaba (chickpea water, the protein from which adds silkiness) and smoked rosemary. Cone’s When the Sun Goes Down in Hye was an Old Fashioned with the Garrison Brothers bourbon, demerara sugar and Angostura bitters. He topped the cocktail off with a caramelized grapefruit wheel. All of the cocktails were inspiring, but second place went to Wagner for his La Rosa Amarilla cocktail made with Garrison Brothers bourbon, mango purée, lemon juice and lavender syrup with a sidecar of Texas history. According to legend, Emily D. West, better known as The Yellow Rose of Texas, was in bed with Santa Anna when Sam Houston’s army launched an attack at the Battle of San Jacinto. Santa Anna was caught with his pants down and General Houston’s army won the battle in 18 minutes. 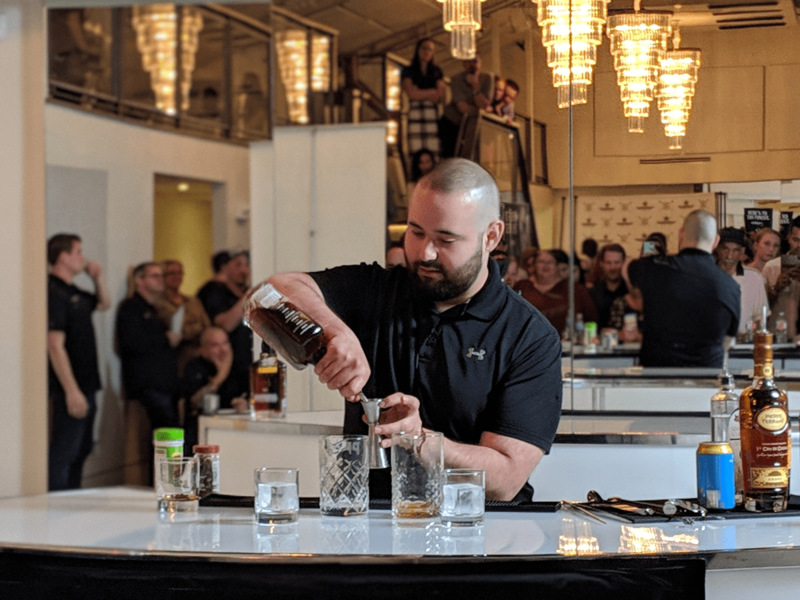 Wagner and Northcutt were then pitted head-to-head in a mystery ingredient cocktail battle. But unlike Iron Chef, the Japanese cooking competition that popularized the ‘mystery ingredient’ and in which competitors had a near-limitless pantry, these creators were given a limited stash of supplies they could use for their final cocktail. Wagner gave the judges a whiskey highball he creatively called The Hye Highball. Northcutt created The Spice is IN cocktail with Galliano, Benedictine, Fernet Blanca, Lillet, peach simple syrup and a few dashes of Creole bitters. Northcutt told us when he tasted the cocktail, he thought he was too heavy-handed with the spice but decided to roll with it and worked the flavor into the name. 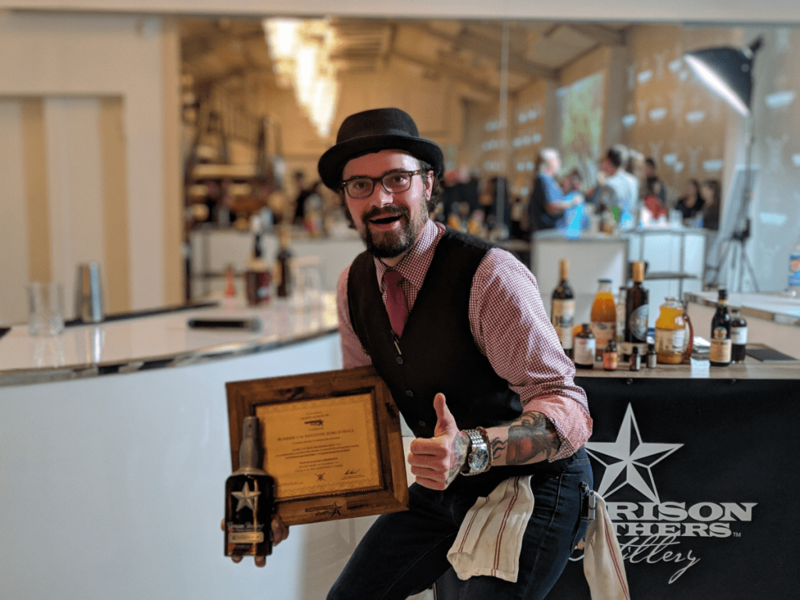 The judges loved the spice and awarded the championship to Northcutt for not only his cocktail, but his knowledge of Garrison Brothers history. “Listening to Cody, I believe he knows more about Garrison Brothers than I do,” said Garrison. 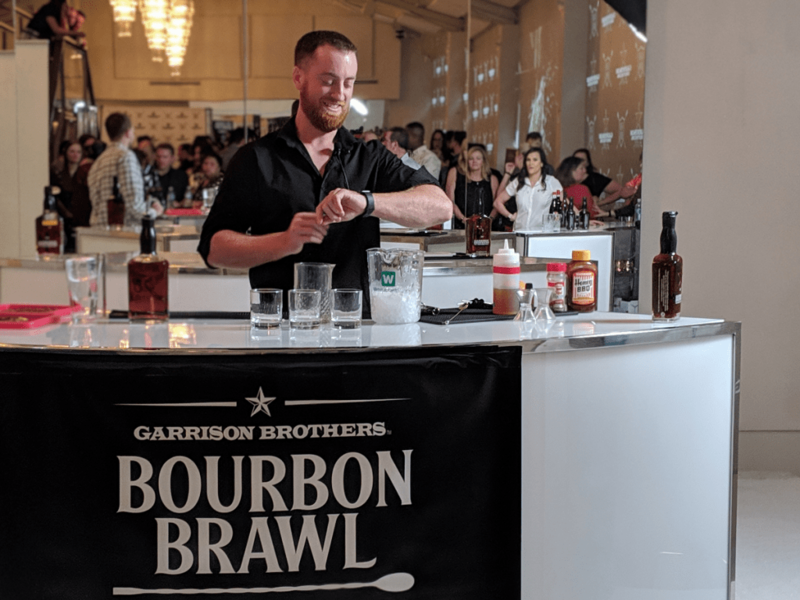 At the Bourbon Brawl finals in Austin this May, Northcutt is competing for a grand prize of $10,000 that’s being awarded from Garrison Brothers’ public charity, Good Bourbon for a Good Cause. 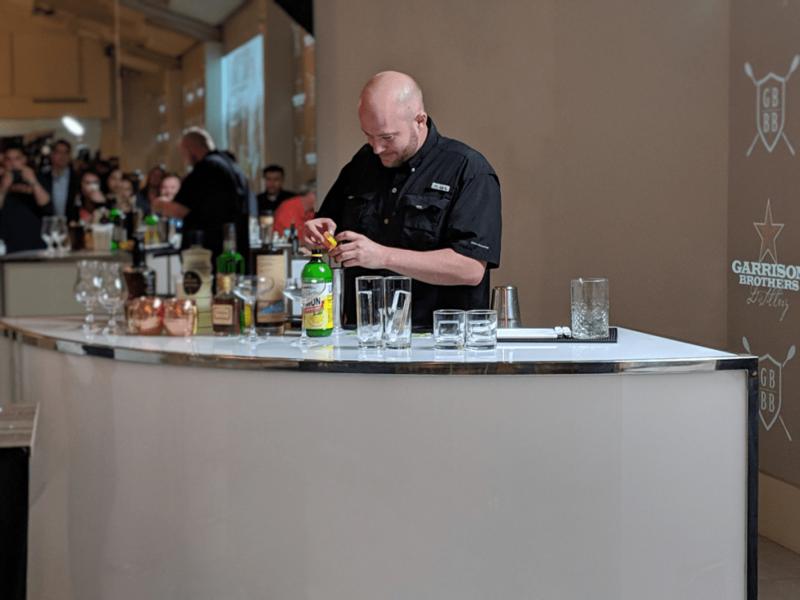 In addition to the cash prize, the winner also gets to teach a series of cocktail classes at Total Wine and More locations throughout Texas and a guest bartending spot at Whiskey on the Rock in Las Vegas. Furthermore, the winning drink is being designated as the official cocktail of Dallas Restaurant Week. Of course, we all know which bartender Houston cocktail fans are going to be rooting for.